A Ferengi DaiMon gives Captain Picard his old ship, the USS Stargazer, free of charge, but when the captain begins reliving the vessel's last battle, it becomes clear that there is more to this deal than meets the eye. I'm willing to believe they've been able to cure the common cold, but all headaches? They've made it so uncommon that the doctor rarely ever sees them? I find that really hard to swallow. Even if they fully mapped out the brain and created methods to regulate simple causes like blood pressure, there are so many potential causes for headaches--including wholly psychological ones--that I don't think we'll ever get to the point where a doctor doesn't come across headaches very often. Like fatigue, fever, or a sour stomach, it's one of those vague symptoms that could mean anything. Next thing you'll tell me is that they've cured coughing. I like how cunning the Ferengi are. Right off the bat, you can read between the lines and sense that DaiMon Bok is a strategist. 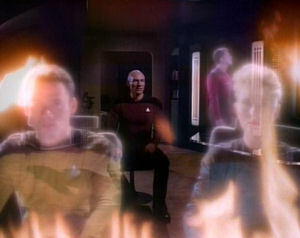 He offers to allow Captain Picard on his vessel, knowing that Picard won't trust him. Thus, he knows there is no chance Picard will agree to that, which is why Bok agrees so easily to visit the Enterprise; that was his plan all along. Why is there an intruder alert when a Starfleet vessel enters the area? Even if the vessel were an alien one, it would not trigger an intruder alert unless an alien beamed on board, intruding. Ferengi transporter effects are cool. I love how, when Bok explains that he's giving Picard the ship at no price, the other Ferengi look at him like he's a heretic. "Ugly. Very ugly." That's good stuff. The Picard Maneuver is, as far as I have come across, the only instance in sci-fi of the reality of faster-than-light travel causing duplicate images of a ship (which it would). It's actually a neat trick, even though when the Enterprise has to deal with it at the end of the episode, how they counter it makes no sense. The defense for the Picard Maneuver should be just firing on the new ship rather than the old one. There's no need to get into silly technobabble like the atmospheric densities of the surrounding gas (which, by the way, also makes no sense, since they're in space). It's nice to finally get some backstory for one of our characters. The thought device looks like a blitzball. "As you humans say, 'I'm all ears.'" Kazago is my favorite Ferengi so far. It's good that Picard has somebody on board he can actually confide in. Though he probably could go to Counselor Troi, it's better that he has Dr. Crusher. Crusher is technically of a lower rank, but they are friends and, as Crusher points out early in the episode, she is the only person on board who can give him orders, which means they have a more equal command relationship than do Troi and Picard. Wesley has way too much free time on his hands. Doesn't he have schoolwork or "Acting Ensign" duties to attend to? Besides, if you were a kid on the Enterprise, wouldn't you spend all your free time on the holodeck? I know I would. Heck, I'd do that as an adult. The thought device is the Star Trek equivalent of the Imperius Curse. They both control other people, and they are both extremely illegal. Picard raises the shields, which is why they can't beam him back from the Stargazer. Then, DaiMon Bok somehow beams out. Then, when preparing for battle, Picard raises the shields again, which is why the transmission cuts out. Wait, what? Number of episodes in which a member of the Enterprise crew is subverted by a strange alien force: 2. Though DaiMon Bok acts nothing like any other Ferengi, the Ferengi, as a whole, are already starting to feel like the Ferengi we come to know later on. At the very least, they're more developed than they were in "The Last Outpost" a few episodes ago. It's weird that people other than Picard refer to Riker as Number One. Good thing that comes to a stop later on.